The Judge and Hart families at Christmas. Grandma Carrie is in the back right, standing. 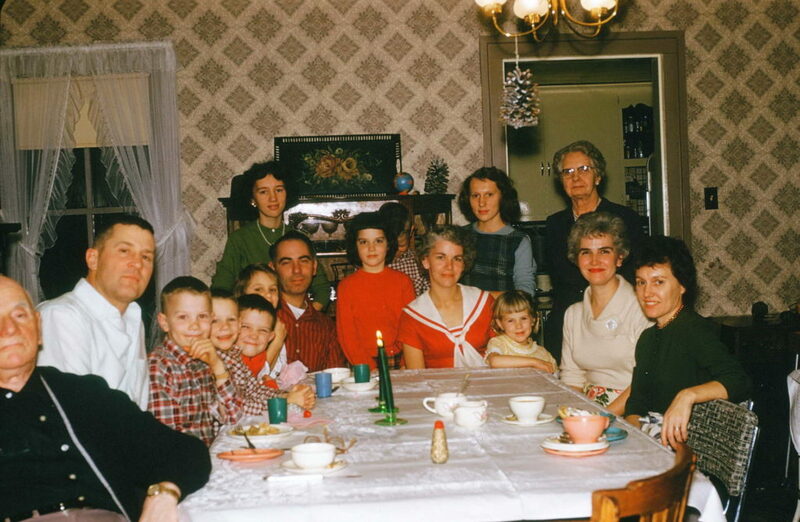 Aunt Betty Judge Hart (red dress) and Uncle Bob Hart (white shirt) lived on a farm in upstate New York. Grandpa Judge is on the left, next to Uncle Bob. 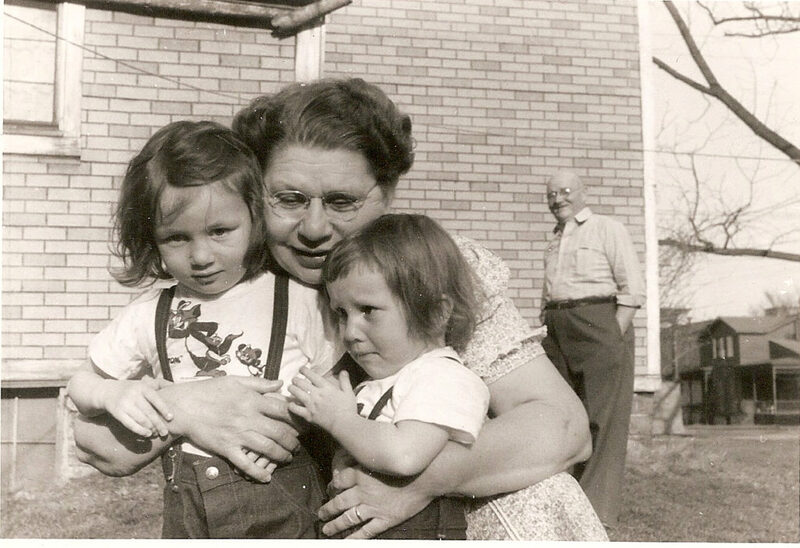 The only American grandmother that most of us (my sisters, cousins, and I) knew growing up was our grandfather’s third wife, who was Grandma Carrie. She wasn’t our dad’s mother – that was Ruth – who was the second wife, and had passed away in 1949. That was 3 years before I was even born. My two older sisters knew Grandma Ruth when they were little girls. But for the most part, my cousins and I knew only Grandma Carrie as our grandmother. I never knew much about Carrie. We only saw her when we visited “the farm” in upstate New York at Christmas, or sometimes in the summer, when I was a kid. By the time my grandpa, John Walter Judge, passed away in October of 1972, Carrie had preceded him in death. But I wasn’t sure when. As the years passed, and after I began working on our family history, I asked occasionally about Carrie, but no one really knew much about her. No one knew her maiden name, or anything about her family. She had married my grandpa late in life, but no one I asked even knew for sure when they married. All I remembered, or for that matter, all that anyone could tell me, was that she had been a teacher. That was all I had to go on. Recently, some New York records have come online, thanks to the efforts of Reclaim the Records. This not-for-profit group uses state Freedom of Information laws to gain access to records that have previously been held by government agencies, locked up and virtually inaccessible to researchers. One of the problems with records like these is that some were released to Ancestry.com exclusively. Reclaim the Records believes they should be made available to all, without being behind a paywall. Thank goodness! 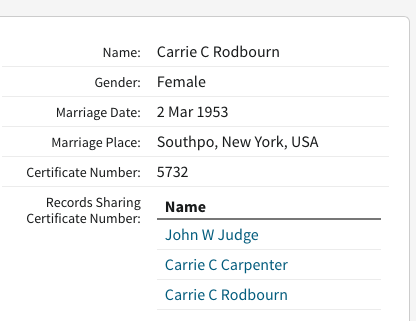 When the marriage records for New York State, 1881-1967, were released, I seized the opportunity to at least find out when my grandfather married Carrie. That was the least I was hoping to find. And I did find out. Grandpa John W. Judge’s marriage to Carrie was in March 1953. But she was listed as Carrie C. Carpenter and Carrie C. Rodbourn. One of these would be her maiden name, and the other, likely a former married name. So which was which? Here’s the record listing from Ancestry.com. They married in Southport, Chemung County, New York on March 2, 1953. From this point it was a matter of searching for Carrie in the Chemung County censuses, keeping in mind that she was a teacher. There were several women with that name, but after looking at all of them, only one seemed to fit: Carrie C. Carpenter, born in Horseheads, New York in 1885. 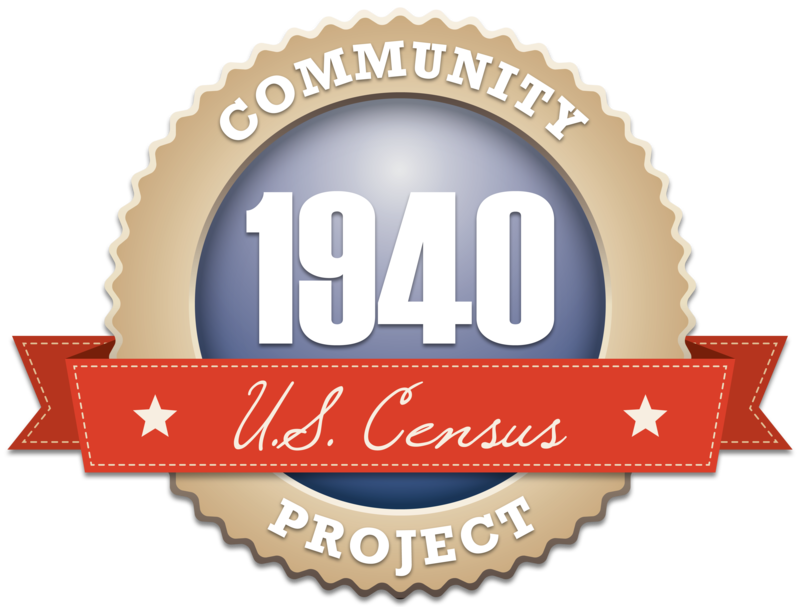 All the censuses from 1910 – 1940 showed her to be a public school teacher, while living in Horseheads with her parents, Joseph and Lavenia. (Her grandfather, Isaac Newton Carpenter, was a pioneer resident of Breesport, arriving from Cortland County in 1855. True to his surname, he worked as a joiner and carpenter.) When she was 44, Carrie’s father, also a carpenter, passed away. Nine months later, her mother died. Carrie went to live with her brother, and in 1930, she married Clarence Lester Hatchcock, an electrician from Georgia. It was her first marriage. She was 45 and he was 38, a divorcé. Ten years later, in 1940, Carrie was a widow. At some point in the following two years (can’t find it in the index for some reason), she married a second time to a local widower named Charles Rodbourn. By this time they were both in their 60s. Charles’ grandparents were both from Wiltshire, England and came to Elmira around 1830. He had served briefly during the Spanish-American War in the late 1890s; later he worked as a farm manager, a bookkeeper in a factory, and sold bonds when he was in his 50s. He and his first wife had four children. When Charles registered in 1942 for the draft in WWII, at the age of 64, he was listed as unemployed. He died in 1949 when he was 71, and Carrie was 64. Perhaps the third time was the charm. As seen above, she and our grandfather married in 1953. It was the third marriage for both. She was 68, and he was 71. Their marriage continued a good 20 years. And I learned from the New York State death records that she died the same year as my grandfather – 1972. She had no children. Her brother William died in 1932, and her sister Josephine in 1924. Carrie is buried in Hilltop Cemetery, in Breesport, New York, along with about 15 other Carpenter family members.